When you’re looking at dining room size you might be starting with a dining room that you need to furnish, or you might be starting with a dining table that you love and want to design a dining room for it, or you might be starting with a blank slate with an idea of how many people you want to be able to seat in your dining room. 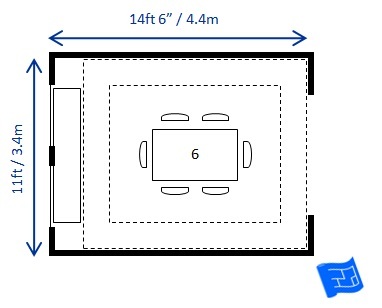 This page explores these three situations, explains how to work out dining room size and gives some example layouts for different dining room sizes. This page is part of the dining room design series. 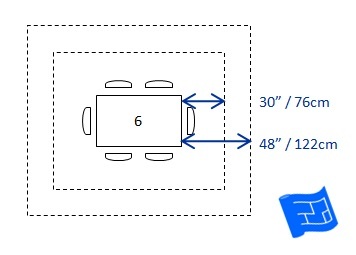 To find out how many people you can seat check out the page on dining table size which covers different shapes and sizes of dining tables. Already have a dining table or working with a dining room to furnish? If you already have a table, or you have a room you want to furnish, the key is to know how much space needs to be left around a dining room table. No matter what shape your table is, leave at least 30 inches (76cm) between the edge of the table and an obstruction (wall or sideboard – or anything else) to allow people to take their seats. With 30 inches it will still be very tight if people get up in the middle of the meal. 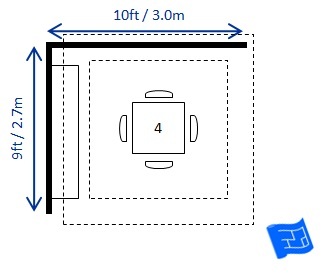 The ideal distance for dining table clearance is 48 inches (122cm). This allows people to come and go from the table comfortably and the proportions of the room will look more elegant. To make sure the table isn't too small for the room, make sure that there isn't more than about 6ft (183cm) from the edge of the table to the nearest wall, window or piece of furniture on at least one side of the table. If you want to put a rug under your dining table make sure it's 30 inches larger than the table on each side that you want to have chairs. Here's an example of some table sizes and clearances. Now that we've looked at the space the dining table needs, to work out dining room size, let’s assume that there’s a table and a sideboard in the room. A useful sideboard is at least 12 inches (30cm) deep and is more likely to be 18 inches deep (45cm) so this needs to be taken into account when working out your dining room dimensions. Other things that have an impact on dining room size and layout are circulation - the location of the door can have an impact on where your dining room table will fit in the room. Design elements like windows and fireplaces also have an impact on how the room is centered. 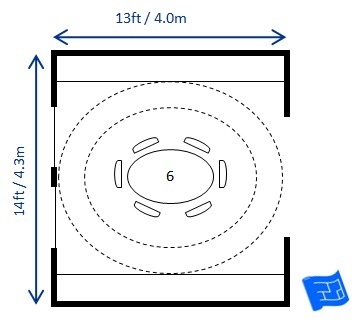 So here's a few dining room sizes with different layouts. There's always a bit of flexibility in how many people can fit round a table and what size dining table can fit into a room. 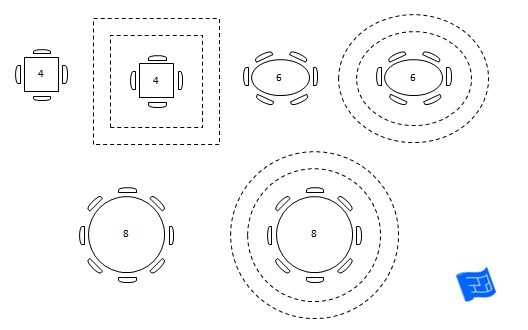 Hopefully these layouts will get you thinking about how your dining room will work. In this dining room for 4 there are dumb waiters rather than a side board. Circular dumb waiters are a really useful addition or alternative to a conventional side board. The door in the dining room layout above opens across the 48 inch dining table clearance but opening the door won't disturb anyone sitting at the table near the door. 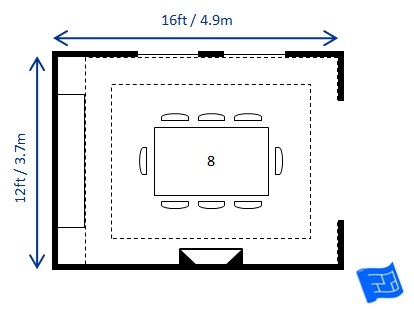 The dining room size required is reduced if it's part of an open plan space. In the dining room layout above there is a bit less than the recommended 48 inches behind the chair in front of the wall and the chair in front of the sideboard. This isn't problematic because there shouldn't be too much circulation behind those chairs when people are seated. The other chairs have plenty of room. 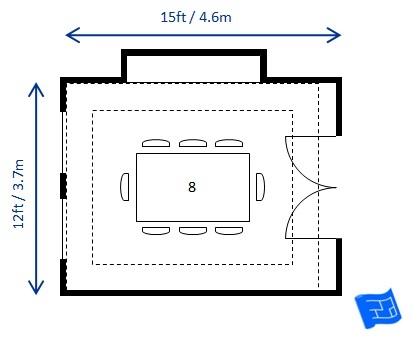 The table could also be pulled further out into the open plan space depending on what is going on in the surrounding space. 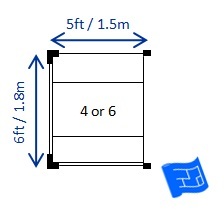 You need 6ft x 5ft to fit in a dining nook. This nook layout has windows on 3 sides. If your dining room size is a bit smaller than you'd like using a bench or banquette instead of chairs on one or more sides can be a great way to solve your dining room size problem. Here a rectangular dining table for 6 sits in an 11ft x 14ft 6inches dining room. There's ample space all around the table and no door to swing into the dining space. This leaves (no pun intended!) some wriggle room to add some leaves to the table to sit 8. In this dining room there are built in side boards (maybe with shelving above) on both sides of the dining room. There's ample room so a leaves could be added to the table to seat 8. 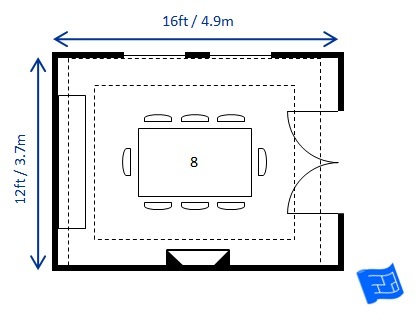 Here's two 12ft x 16ft dining rooms with tables for 8. Let's compare the two layouts. 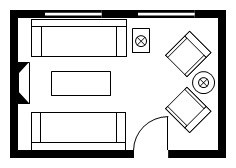 The top dining room layout is open at one end and has a sideboard. Notice how the fireplace and windows have been designed slightly off center so that they are centered with where the table sits. If we look at the dining room with the double doors, the fireplace and windows are central in the room - again matching where the table will sit given the location of the doors and the sideboard. Making things feel centered can be tricky in dining rooms. 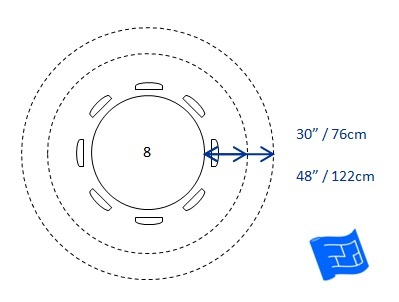 If you're designing a room from scratch think carefully about how the room will be centered. 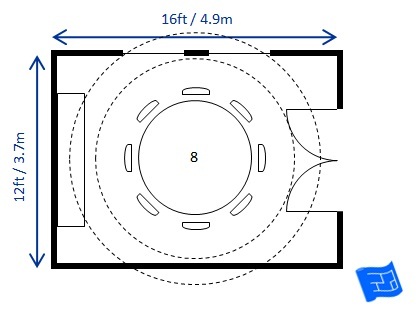 Here's the same 12 x 16ft dining room for 8 with a circular table. 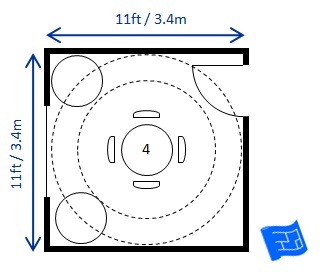 This room is fine for a rectangular table but it's a squeeze in some parts of the room with a circular table. Here's a dining room where the side board has been placed in an alcove. This helps keep the room centered and saves on square footage. The indents resulting from the alcove could be used for niche seating or built in shelving in the room next door. 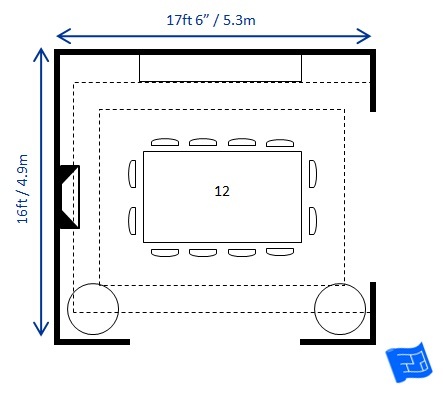 You need about 16ft x 17ft 6" of dining room space to fit in a dining table for 12, a sideboard and a few plants or dumb waiters.